JERUSALEM -- For six decades, Sam Sabbagh carried a good luck charm -- a parchment he found on the floor of a burned synagogue. Turns out that parchment likely is more than 1,000 years old, a fragment of the most authoritative manuscript of the Hebrew Bible. His family plans to present it to a Jerusalem institute next week, officials said Thursday. 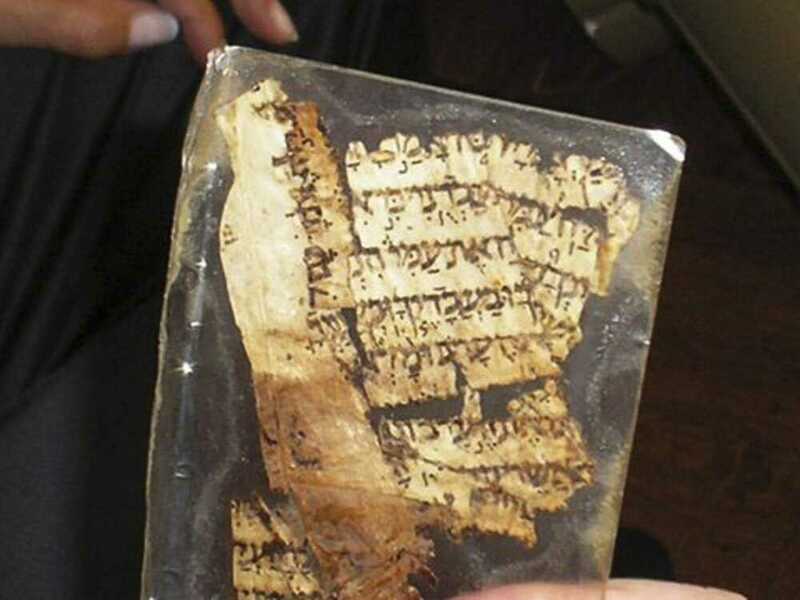 The parchment, about "the size of a credit card," is believed to be part of the Aleppo Codex manuscript of the Hebrew Bible, said Michael Glatzer, academic secretary of the Yad Ben Zvi institute. It contains verses from the Book of Exodus describing the plagues in Egypt, including the words of Moses to Pharaoh, "Let my people go, that they may serve me." In 1947, Sabbagh, then 17, picked up a piece of the manuscript off the floor of a synagogue in Aleppo, Syria. The synagogue had been burned the previous day in riots after the United Nations decided to partition Palestine, a step toward creating the Jewish state of Israel. When Sabbagh later immigrated to Brooklyn, he carried the parchment around for years in a plastic pouch in his wallet, Glatzer said. Sabbagh used it as a good luck charm, even bringing it with him when he underwent open heart surgery. About 20 years ago, a Jewish studies institute in Jerusalem named after Israel's second president, Yad Ben Zvi, learned of the fragment's existence. But it was unable to persuade Sabbagh to part with it. After he died two years ago, his family decided to donate it to the institute. The recovery "is important in the sense that we are getting the chance to unify the missing parts and put them in their original place," said Michael Maggen, who as head of paper conservation at the Israel Museum will oversee restoring the document. The codex "is not just another manuscript -- it's a landmark," Maggen said, mainly because it provides insights into key aspects of Hebrew grammar and pronunciation. Portions of the codex that have already been retrieved are on display in the Shrine of the Book at the Israel Museum in Jerusalem. The Sabbagh fragment would eventually join its counterparts there, Glatzer said. Glatzer hopes that the parchment's recovery will encourage others to check their safety deposit boxes and attics for similar treasures. "What [Sabbagh] did, others must have done," he said. The codex, also known as the Masoretic Text, was written in Tiberias, next to the Sea of Galilee, in the 10th century and later brought to Jerusalem. It then traveled to Cairo, after which, according to tradition, Moses Maimonides' grandson brought it to Syria. The elder Maimonides was a 12th-century Jewish scholar whose writings and rulings are still followed and studied. "We have only about 60 percent of the codex -- more than a third is still missing," said Aron Dotan, professor of Hebrew and Semitic languages at Tel Aviv University. The missing part includes most of the Torah, or Pentateuch, he said. The codex comprised the books of the Old Testament. Although only a tiny scrap, the find is still noteworthy, he said. "Every find is something, every new piece is something," he said. "It is an addition to what we have."